Its quite difficult to pick out the good stuff from the products that are hyped on those 24 hour shopping channels. There are so many "miracle products" out there that promise to turn you into that hunk or hunkess. Or at least, you make the association unconsciously although it is much more likely that they got their bodies out of a tin. Still, it would be wrong to dismiss everything that is sold on Shopaholic TV. If you want to have huge and impressive but not particularly useful muscles, the best way to do this is to lift extremely heavy weights using those machines that you find in the gym. There isn't much point thinking about buying these machines unless you have tons of space (and money) because they work very specific muscles and so you need many of them. This is because the movement is constrained or supported and so you don't use any of those smaller muscles which are needed to move things in "real life" (things don't usually move in perfectly straight lines). In fact, it is very easy to end up with severe muscle imbalances that, while they may look impressive, they could easily become injured doing real work. In fact, most body builders use free weights (that is to say, dumbells) for this reason. If you have any doubt why you should need to do strength work while training for an Ironman just work out the number of steps you take in a Marathon and multiply that by one or two times your body weight (your impact force in running). Now imagine going to the gym for the first time and lifting 150 kilos, say, 40,000 times! Strength training in endurance events is absolutely fundamental to avoid injury and it will also improve your performance. Muscles can also have different kinds of strengths. The muscles are made up of many fibres that are of different types. Simplifying things somewhat, there are aerobic fibres - the dark meat you get on chicken legs for example, which are good for endurance - and anaerobic fibres - the white meat of the chicken breast, which are good for explosive power. It is believed that we are endowed with a proportion of each of these fibres genetically. This doesn't mean that the day we are born, it has already been written whether we have the potential to be a Usain Bolt or a Haile Gebrselassie. Luckily, there is a third type of muscle fibre which can change from aerobic to anaerobic, or vice versa, as a function of training. This is one of the main reasons, I believe, for why so much low intensity training is necessary for a long distance event. I'm always fascinated by the fact that, as soon as you go over 400m, the bodies of the dominant athletes of that distance change dramatically from those Superman-like figures, to frankly quite weedy looking guys. But don't be deceived, those stick like legs are capable of supporting incredible loads, over and over again. This is because they have been trained to use a much higher proportion of their muscle fibres. A body builder is more interested in having big muscles - there is no penalty for weighing more in his or her sport - so, the less fibres he activates proportionally, the better: that way, his muscles must get bigger in order to cope with the stresses he puts on them. A long (or middle) distance runner must be efficient first and foremost. The good news is that you can do a surprising amount of effective training at home with a few silly looking (and relatvely cheap) bits of kit. It is surprising how much more effective it is doing almost any exercise while balanced on this ball: you notice it the next day. The reason is very simple: your brain automatically activates many more muscles and muscle fibres in order to stop you falling off. There are all kinds of different routines you can do on it, many of which you can find on the internet or just invent yourself. Incidentally, the classic stomach crunches or "abs" of the 80s went out with deely boppers and Mike Oldfield. This is for very much the same reasons as above. If you want to have a rippling six pack then that's all fine and well (although you'll need to get your body fat to less than 6% if you actually want to see them) but you can actually give yourself postural problems by overworking this group of muscles. The core muscles are crucial for running as they are for most sports, and they comprise not only the outer, visible layer, but an inner belt of muscles which are equally important and balance the outer ring. 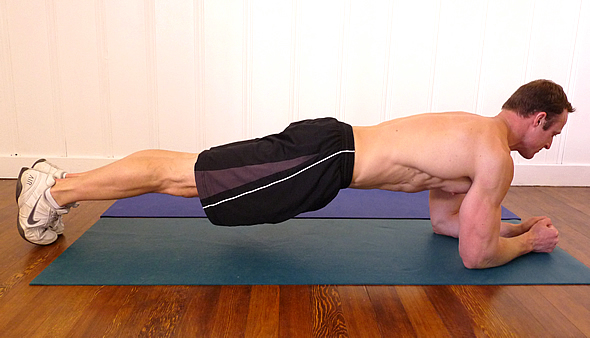 It is much better to train both these sets of muscles using either the Swiss Ball or doing what is called the "plank" or one of its many variants. These don't really need much of an introduction. They work very well for two reasons. The first is that, any movement you make while they are in tension is unrestrained, so you activate many more muscles. The second, rather obvious reason, is that, unlike weights, the resistance increases as you stretch the cord so you get the perfect amount of resistance each time. I haven't even bothered to find out what TRX stands for but it is a great example of "branding". The concept is simple - by suspending various bit of your body you can get a very effective workout with all the advantages of free weights plus the fact the equipment weighs next to nothing and can easily fit in your suitcase. It definitely beats using the hotel gym when you are on a business trip. The downside is that branding comes at a price - about €200 to be precise. It's such a simple idea that it is very easy to copy and this is exactly what has happened. I picked up some which are just as functional at a third of the price; you could probably make your own for less. 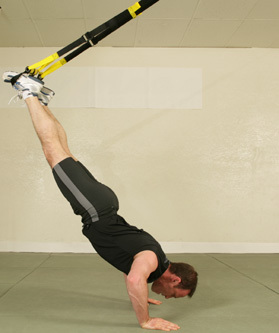 This can be used both right way up and upside down for loads of different types of instability exercises. The reason why it is useful to have this and the Swiss Ball is that you could hardly imagine doing what this guy is doing, balancing on a Swiss Ball! It is very good for all the lower leg and feet muscles which are so important for running. You can also combine its use with other exercises, pulling on the Stretch Cords while standing on it, etc. Wouldn't it be great if you had a ready set of weights, all about the appropriate size of your body weight, say, and that you could carry around everywhere with you while taking up no extra space and not weighing a thing when not in use? Of course, everybody has this for free - it is their own body weight. For example, a very difficult exercise you can do are Nordic Hamstring Lowers (pictured left) - be careful at first! If you haven't got a handy helper around, you can get a bar which will fix to door frames and doubles as a pull up bar. I'm starting to notice that these Scandanavians seem to be at the forefront of Sports Physiology time and time again. Both Polar and Suunto (the most popular heart rate monitors) are Finish companies. There must be some truth in what they say about that Viking blood they have. If anything looks like the con of the century, then this must be it. And, anyway, didn't they claim you could lose weight with them back in the 80s? Its possible that it was once thought that you could somehow break down fats by shaking them to pieces but these platforms were found to be useful for Astronauts who, without that useful thing called gravity were unable to do any of the above exercises. Furthermore, without any impact from walking about, they developed serious cases of osteoporosis as the body noticed that all that useless bone wasn't good for anything and started to redeploy those cells elsewhere. The vibrating platform was thus saved from obscurity. Meanwhile, some athletes noticed that it did actually have a training effect. Specifically, the vibrations trick the brain into believing that the body is going out of balance or that it is about to land hard and so your brain activates your muscles in preparation. It is similar, I suppose, to electrostimulation in that your muscles (and apparently very high proportions of their fibres) are being activated without you making the mental effort to do so. 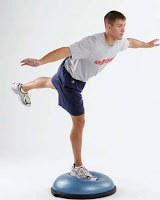 The advantage of the Vibrating Platform is that you can apply it to large areas of your body at a time. For the same reason it helped the Astronauts, it is also good to strengthen or rehabilitate bones, tendons and ligaments. My coach has even written an acdademic paper demonstrating the improvement in jumping of a women's basketball team as a result of vibration training. Still, this doesn't really fit into the category of "home gym" as it is big, bulky and very expensive (I certainly don't have one). If you are going to buy one big item, then this is a good one as very few gyms have them and they are often monopolised by people (incorrectly) thinking that they can use them to lose cellulite. By the way, don't be fooled by the cheaper models - if you are going to buy one, make sure you check the specs of frequency and amplitude of vibration.